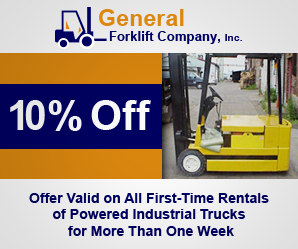 Gain some peace of mind when you need a forklift for a project when you work with the forklift rental and sales team at General Forklift Company, Inc. Since rentals are ideal for short-term needs, let our team lend you a helping hand without stretching out your budget. From electric stackers to pallet jacks, you never have to worry about a thing when you rent equipment from our team. As we are committed to your material handling needs. We work with you to find everything you need, at our warehouse or elsewhere, for a job well done. Always know that you have the right equipment for the job when you turn to our forklift rental company in Staten Island, New York. Since 1980, General Forklift Company, Inc., has been dedicated to delivering an unparalleled customer service experience without sacrificing your time or bottom line. We offer you only top-of-the-line industrial-grade forklifts, electric stackers, and pallet jacks, as well as live 24-hour support service, ensuring that your operation never misses a beat. We also provide you with specialized equipment rental in the event that conventional forklifts cannot meet your needs. Request a rental to discover why we are your first-choice forklift rental company.